This is mostly a philosophical book and so may be difficult to read, yet it is the kind of difficult read that yields much harvest. This book calls for an individual to pull away from the frenzied life of working, planning, and doing in order that they may engage in leisure. 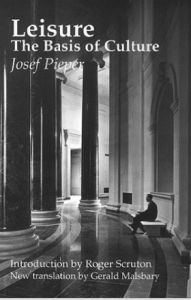 What is so piercing about this book is what Pieper ultimately calls such a life and what he understands leisure to be. The so-called life of busyness, Pieper argues, is almost always anything but true busyness and creativity. Rather, it is idleness in fiendish form. It is failing to slow down and understand what life is all about and where it is going. Therefore, such busyness is empty wandering (vanity). Leisure, on the other hand, is not the cessation of work (as many think) but the slowing down so as to consider what is true and how truth changes how we live. Pieper then moves to show how important our religion is if we are people of leisure. If we have true leisure (contemplation of the truth and its consequences), then what we consider to be true (religion) is important. If we know God and we worship Him, then we ought to let that worship inform our everyday actions and guide our lives. The culture that is formed out of such contemplation of God and his truth is essential to a healthy society. Pieper wrote this book in Germany right after World War II to help rebuild a broken country. In an American culture where busyness is exalted and the only time we find to slow down is usually filled with ‘amusement’ instead of ‘musing’ we would do well to listen to much of what Pieper says.